Considering there are 29+ million people in the United States who have diabetes—and 86 million adults over the age of 20 who have prediabetes—the disease is clearly a major concern. Diabetes causes wide-ranging issues throughout the body, but far too little attention is given to the lower limbs. This can be a major mistake, however. With diabetes raising the risk for kidney failure, blindness, heart attacks, and strokes, we understand how foot health might not seem terribly important and can get lost in the shuffle. The problem with this is the fact that diabetic foot ulcers have a mortality rate surpassing the rates for colon, prostate, and breast cancers! Small issues can quickly escalate into major problems in the lower limbs. This means you should know what is entailed with treating skin conditions when you have diabetes. Before we talk about treatment, let’s start by looking at why skin conditions are a problem. As you likely know, diabetes is a condition caused by too much sugar (glucose) in the blood stream. This situation—heightened blood glucose levels—creates problems in various body systems (including the immune, circulatory, and nervous systems). More specifically, excess blood sugar causes constriction in blood vessels, damages nerve tissues, and impairs white blood cells that fight infection. One of the best moves you can make to keep your skin (and your whole body, really) safe is to control your blood sugar levels. Follow your doctor’s orders with regards to the recommended range as if your life depends on it – because it does! With all the systemic damage from diabetes, anything unusual can become a serious problem. Regarding skin conditions specifically, two main concerns are the fact some issues are caused by microorganisms (which an impaired immune system is less capable of fighting off) and others create openings in the body’s outer layer of protection. Openings are pathways that enable bacteria and viruses to get inside and really cause some severe damage. Along with managing your glucose levels, you need to take measures to keep your feet dry, but not too dry. Wearing diabetic footwear made from breathable materials is one way to prevent feet from becoming too damp. Using approved moisturizers on the tops and bottoms—but not between toes (due to increased risk of bacterial or fungal growth)—will help ensure the skin doesn’t become dry to the point it starts to crack and fissure. 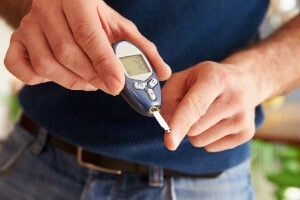 Treatment for skin conditions is absolutely essential when diabetes is in the picture, and especially early treatment. When conditions have been left unaddressed, they can escalate quickly into emergency situations. Skin breakdown (ulceration) from this disease is a leading cause of limb amputation. Further, diabetic foot ulcers can even put your life at risk. The nature of the treatment for a skin condition will certainly depend on the situation (what is happening, how long the problem has been present, etc.). Something that is not situation-dependent is the fact that you should seek professional care for any health problem that arises. Even something that might not seem like a really big problem—ingrown toenails, calluses, tiny scrapes—is actually very concerning for a diabetic individual. A key component to keeping feet safe is to have a comprehensive diabetic foot care plan in place. This plan needs to be centered on preventing problems, detecting them early (when they do arise), and then seeking treatment at the earliest possible opportunity. Part of this includes also regularly-scheduled appointments with our office (so we can make sure there are no concerning issues). If you need to create a diabetic foot care plan, have discovered a potential problem and need treatment, or simply have any questions regarding this important matter, simply contact Martin Foot and Ankle. You can either take advantage of our online form to connect with us or call (717) 757-3537 and speak with one of our team members.